Join us as we blast across the stars on our May voyage, to explore the furthest reaches of the universe. Chester Wind Band will be out and about spreading the festive cheer during December. Keep and eye (and an ear) out and come and say hello! The band will be performing a selection of carols and musical items alongside the City of Chester Male Voice Choir and the Countess of Chester Singers beneath the canopy of the Emergency Department. The service will be lead by Rev John Kingsley. The band will be performing between 11am and 2pm on both Saturdays before Christmas in the Forum Shopping Centre in Chester. We will be playing a selection of easy listening Christmas items intertwined with the usual carols. Guaranteed to make you feel festive! Join us for our annual Last Night of the Proms concert featuring Wirral Pipe Band! 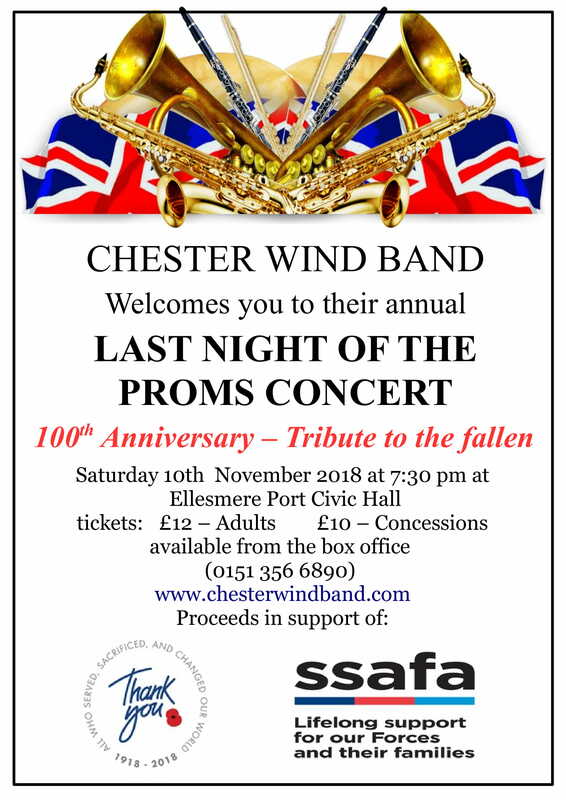 The concert will pay tribute to the 100th anniversary of the end of WWI and feature a variety of commemorative and reflective music, including marches and programmatic film music. The concert will also feature the usual Proms festivities, including all the audience singalong favourites. Profits will be donated to local branches of The Royal British Legion and SSAFA. Chester Wind Band have joined Facebook! With over 2 billion active users, you can keep up to date with the latest news and concert information on the worlds most popular social media platform. Click the link to the right and give us a like! 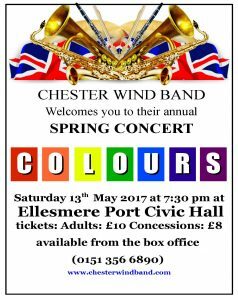 Chester Wind Band will be returning to Ellesmere Port Civic Hall for our eighteenth annual Last Night of the Proms. To thank Blacon High School for the wonderful support they have given the band since 1989 and especially during the move to the new school, the band has decided to raise money for the school and also for Edsential’s charity, The Chairman’s Trust, from the profits of this November’s concert. This year the first part of the concert will have an American theme before going on to perform the traditional LNOP pieces such as British Sea Songs, Pomp and Circumstance and Jerusalem. In addition, the Edsential Music Service will be producing a choir of local primary children to perform three Disney songs midway through the first half. The Chester Wind Band clarinet and saxophone groups will be peforming as part of the Chester Lions Musical Extravaganza on Tuesday 13th September 2016 at Eaton Hall. We will be playing in the Long Room and the concert starts at 7.30 pm. This should be a fantastic night with lots of interesting and entertaining performances from various local musicians. After the summer break, rehearsals will restart on Monday 12th September at Blacon High School new build. The new hall looks a really good place for rehearsals. As always, new members are very welcome. Rehearsals start at 7.oopm, prompt, and normally finish at 9.00 pm. 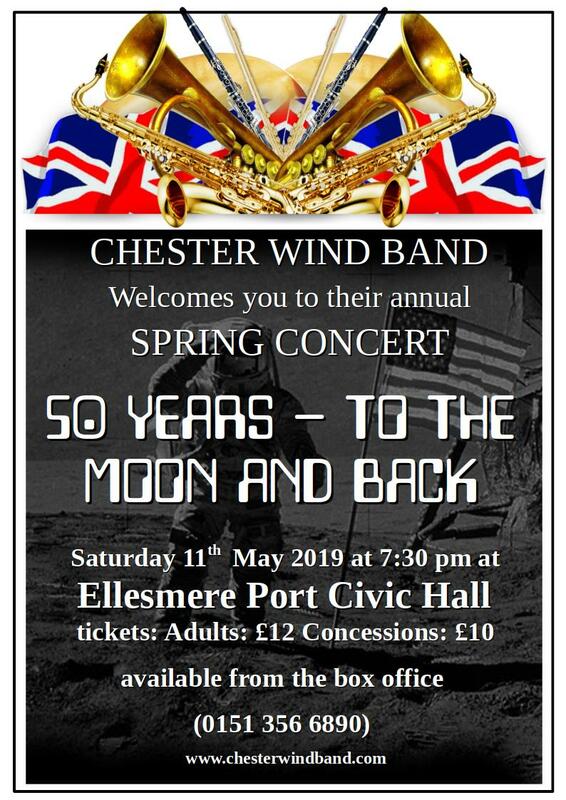 Please find attached the poster for this years Spring Concert which will be taking place at Ellesmere Port Civic Hall on Saturday 14th May at 7.30pm. The theme for this year is ‘World of Dance’ and should be a very enjoyable evening.